The Declaration o the Richts o Man an o the Ceetizen o 1789 is a fundamental document o the French Revolution an in the history o human richts. 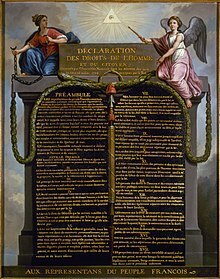 The Declaration o the richts o Man an o the Ceetizen (French: Déclaration des droits de l'homme et du citoyen), passed bi Fraunce's Naitional Constituent Assembly in August 1789, is a fundamental document o the French Revolution an in the history o human an ceevil richts. The Declaration wis directly influenced bi Thomas Jefferson, wirkin wi General Lafayette, wha introduced it. ↑ The French teetle is sometimes translatit as "Declaration o Human an Ceevic Richts". ↑ Gregory Fremont-Barnes (2007). Encyclopedia of the Age of Political Revolutions and New Ideologies, 1760-1815. Greenwood. p. 190. This page wis last eeditit on 27 Juin 2016, at 00:43.